Hastings United’s footballers came through their FA Cup replay at The Pilot Field tonight (Tuesday). The U’s won 3-2 at home to nine-man Herne Bay to set up another home tie against higher grade Poole Town in third round qualifying on Saturday October 10. Well-worked goals from Sam Crabb, Billy Medlock and Sam Cole put United 3-0 up inside an hour, but despite having a player sent-off immediately prior to United’s third goal, Bay pulled two goals back before having a second man red carded in added time. United were forced into a late reshuffle after Sean Ray pulled out injured in the warm-up, but came flying out of the blocks and completed dominated the opening quarter-of-an-hour with a high tempo game featuring some very good passing football. Cole had a shot cleared off the line in the first two minutes and United took a deserved lead 10 minutes later. Zac Attwood did well to get his cross away from near the byline on the left and the ball made its way through to Sam Crabb, who side-footed a controlled finish into the bottom corner as it bounced up for his first United goal. Herne Bay came into the game as play became more even during the last half-an-hour of the opening period, but United still carved out the vast majority of the goalscoring opportunities. Away goalkeeper Jack Delo had to backpeddle to tip over a long range Sam Adams chip before Jack Harris, who wouldn’t have started had Ray not pulled out, stepped inside his man and flashed a terrific left-foot strike just wide of the far top corner. United stopper Josh Pelling made a smart save to repel Mark Lovell’s near post header, while at the other end, a dangerous cross from the left by Attwood was turned against the crossbar by Harris at full stretch from close range. United capped a first half display as good as any they’ve produced at The Pilot Field so far this season by doubling their lead in the 42nd minute. Harris played a good ball through to strike partner Medlock, who turned and fired a low shot past Delo. The hosts had a let-off in the first 20 seconds of the second half, though, when Elliot Cutts - one of two Herne Bay half time substitutes - shot wide from a great position inside the box. Ollie Rowe’s header from an Adams free kick at the other end was nodded away from near the line before United made it 3-0 in the 56th minute. An excellent move ended with Alfie Hall being brought down in the box by Joe Nelder following a neat one-two with Medlock. Nelder was shown a second yellow card and Cole slammed home the resulting penalty. 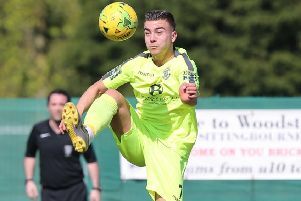 As they had in the drawn first meeting between the clubs on Saturday, Herne Bay showed plenty of fight and pulled one back in slightly bizarre fashion in the 77th minute. Kane Phillip’s cross from the right was bundled home by Lovell and although the linesman had his flag raised, the referee consulted him and awarded the goal. Pelling did well to claw away an awkward cross by Danny Williams and Medlock drilled just over from distance before Herne Bay got back to 3-2 in the 90th minute courtesy of Sam Hasler’s rocket-like shot from fully 30 yards which gave Pelling no chance. The scoreline was suddenly a lot closer than it had looked like being, but the only action of note in added time saw Herne Bay substitute Phillip given a straight red card for scything down Harris. United: Pelling, Crabb, Hall (Richardson-Brown 62), Rowe, Harris, Vickers, Adams, Cruttwell, Attwood (Hollobone 73), Medlock (Temba 89), Cole. Subs not used: Ray, Hanifan, Okoh, Rose. Attendance: 301.